Haiti was already the poorest nation in the Western hemisphere before Tuesday's earthquake struck. But it wasn't always that way. Once the small island country was the economic jewel of the Caribbean. "Officially the French come into control of what they name Saint Domingue, which is the colony that will eventually become Haiti," said Natasha Lightfoot, a professor of history at New York's Columbia University. She said that the French enriched themselves by developing coffee and sugar plantations there: "They actually are able to turn it into the jewel of their crown." To operate the plantations over the next century, the French would import hundreds of thousands of slaves from Africa, many of whom were literally worked to death. But in 1789, word of revolution in France made its way to its Carribean colony. That, Lightfoot said, ignited the slaves to revolt, and the French could not put that rebellion down. Slaves outnumbered the colonists 10 to 1. Their rebellion would lead to independence for Haiti. It would also alter the course of a young country called the United States. At the time, the U.S. was looking to buy the French-controlled port of New Orleans. But Napoleon surprised the Americans by offering a much bigger land deal . 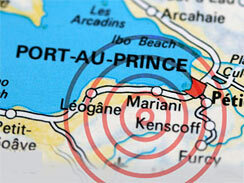 . . land the French emperor no longer wanted, after losing his most profitable colony in Haiti. "Once that's lost, France says, 'Well, you can have the whole of the Louisiana territory, not just New Orleans,'" said Lightfoot. The Louisiana Purchase would double the size of the United States. "So the American Midwest as we know it would not really exist without the Haitian revolution pushing France to give up on its design for empire in the Western hemisphere," said Lightfoot. Haiti became the only nation to gain independence by a slave-led rebellion. Its new flag was derived from the French tricolor, which was turned on its side - and the white stripe symbolically stripped off. But before withdrawing in 1825, France had demanded reparations for the loss of its economic and human property of 150 million francs - about $21 billion in today's money. Twenty-one billion dollars . . . a crushing debt which, though later reduced, Haiti would not pay off until 1947. As a result, the young country never really got on its feet. In 65 years, Haiti would have 22 heads of state. "By the time we get to the 20th century, Haiti is a very unstable place, economically and politically," said Lightfoot. In 1915, U.S. Marines invaded to restore stability - and extend our sphere of influence. Haiti would remain under U.S. control for the next 19 years. But nothing could break the cycle of political turmoil. In 1957, Francois Duvalier, a doctor and union leader, was elected president. Papa Doc's regime became notorious for rampant corruption, torture and terrorism - kept in power by his personal civil guard, the notorious Tonton Macoutes. It's estimated the Tonton Macoutes were responsible for 30,000 deaths. The United States supported the Duvalier regime at the time, said CBS News correspondent Bert Quint, out of worries about the spread of communism. 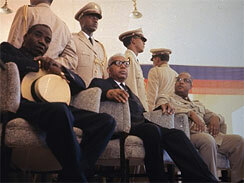 Papa Doc was succeeded by his son, Jean-Claude Duvalier, a.k.a. Baby Doc. In 1972 he told "60 Minutes"' Mike Wallace, "The aim of my government is to increase the volume of foreign investment, and at the same time promote tourism." But the Duvaliers' repression crushed the fledgling tourist industry and drove many of the country's educated professionals into exile . . . before the U.S. finally helped oust Baby Doc in 1986. "I can only tell you I hope we can be of help as this interim government goes forward and tries to introduce democracy to Haiti," President Reagan said then. Haiti has never really recovered . . . plagued by an epidemic of political coups, and more recently by nature. Four hurricanes battered the country in 2008. Two centuries ago, in its darkest hour, Haiti rose up from slavery to become a nation. Somehow it must rise up again.